I know nothing about this author... seriously, except that when I Googled his name, I came up with this reference to a mysterious book he wrote on UFOs called An Encyclopedia of Flying Saucers. How cool/freaky is that? You see, sure... I worked in a bookstore forever and sure I flacked for a publishing house in New York, but basically, all that I know about children's books is learned from finding a book or author on a junk shop shelf and falling in love and basically Googling my way to wisdom. That is the scary thing about the Internet. Who knows how accurate what we read on here is.... so never ever ever feel afraid of correcting me when I am wrong. Ha! 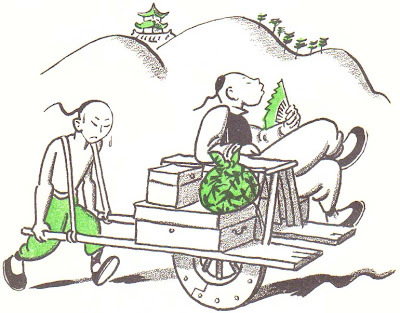 That said, this book caught my eye while I was in Maine, because at first glance it was obviously the work of Wiese... the illustrator of my son's favorite book ~ The Story About Ping ~ as well as one of the few books my husband remembers from his youth, Five Chinese Brothers. He grasped the spear in his left hand, the sword in his right, and ran towards the cave shouting to the dragon to come out. Hissing like a steam engine, the dragon slithered out of the cave and rushed towards Ting Ling, its great, red mouth wide open. And Ting Ling stepped right into the dragon's mouth. Now, Ting Ling is a pretty clever boy, and I don't want to give away his awesome logic, but I will say he follows up this achievement with feat after successful feat until at last the Emperor suffers a stroke of apoplexy and perishes on the spot. Moral of the story, let your children live their own lives lest the anxiety give you a heart attack. I have just stumbled over you blog when looking up a copy of 'What's for lunch Charley?' and I am so thrilled to have found it. I will have to trawl through the entries. As mother of a 2 and a half year year old boy, English teacher and general bibliophile this was most fortuitous. Fabulous - I will definitely follow. I definitely had this one. I remember that picture with the big bell. In my mind I conflated this book and the Chinese Brothers book. NOW I know where those "missing scenes" are! 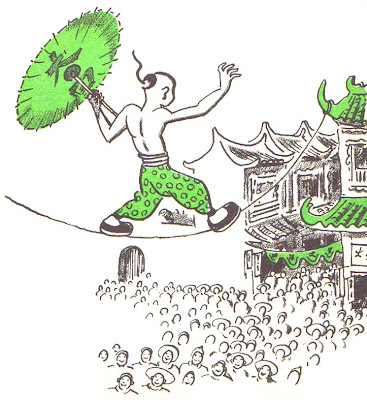 I loved this book and the picture of Ting Ling tugging on the bell really roused some memories! I had no idea about this book! 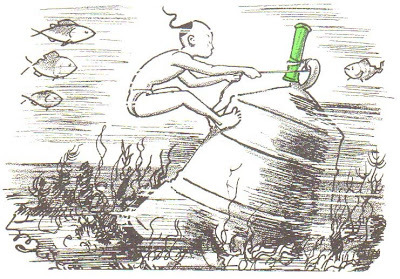 I already have The Story of Ping and the Five Chinese Brothers. 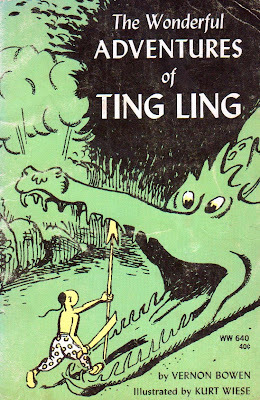 The Wonderful Adventures of Ting Ling was my most treasured book when i was growing up. I read it for many years, just to remind myself that if Ting Ling could do all that he did to overcome the impossible, then maybe i could think through my problems, and succeed as well. I just showed my 10 year old daughter the pictures here from the book, and retold the story to her as best as i could remember. She was immensely impressed with Ting Ling's logic and wisdom, not to mention his bravery! I only had three children's books as a child; this, "Brian the Brain" and one more i cannot now remember the title of. Even as an adult, this book always reminded me that perseverance wins out and taught wonderful nuggets of wisdom. Thank you for featuring this wonderful old book. It has forever been an inspiration for me.